For those who may not have thought about how HVAC works at all — bless you in your ability to remain ignorant of this, by the way, as those of us living in Texas view HVAC kind of the way astronauts think of their oxygen delivery systems when spacewalking — the best explanation I ever received was from a friend of my father’s who worked in the industry. His tip was simple: don’t ever think of your air conditioner as “cooling air,” but rather as “moving heat around.” To cool the air inside, it extracts heat and moves it outside. Heat pumps move heat through the concept of latent heat, “the heat release or absorbed by a body or a thermodynamic system during a process that occurs without a change in temperature.” So, for example, in an air conditioner, gaseous refrigerant enters coils where air blowing over it removes energy, causing the refrigerant to condense — to change state from gas to liquid. When it does so, it releases that energy in the form of heat into the outside environment, dispersed by the fan. The liquid refrigerant flows back into the house and eventually through another coil placed in your A/C ductwork. The ducts direct inside air over the coil. The refrigerant in the coil absorbs energy (heat) from the air, using this energy (again through the latent heat concept) to transform back into a gaseous state. The gas flows out to the outside coil. Wash. Rinse. Repeat. Bammo: You don’t die when it’s 110 degrees outside (again). All air refrigerant-based systems are technically “heat pumps,” but a while back they started to release newer systems that actually carried the name “heat pump.” These units features the ability to reverse the system’s flow in the wintertime to condense in the home and evaporate outside, pumping from outdoors to indoors, heating the house. Since the efficiency of such systems varies based on the difference in temperature outdoors and indoors, they can’t always provide enough heating — or enough heating quickly enough — to make us happy, so most heat pump units include an electrical “emergency heat” coil which makes up the difference. 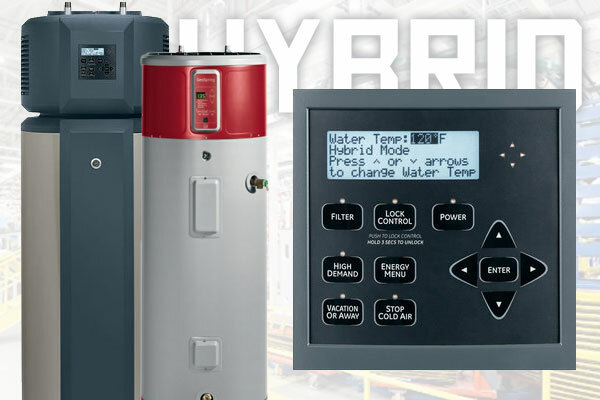 They’re essentially “hybrids” — just like the GE water heater. All GE has done here is apply the same idea to a water heater. An evaporator on top of the tank collects heat from the surrounding environment and carries it to a condenser, which releases the heat into the water. An electric “emergency heat” coil makes up the difference. GE claims some pretty significant savings on energy bills over the cost of a standard heater — up to $3,250 over a 10-year period. (Try their calculator to find your own predicted savings.) The unit itself looks pretty sweet, too, complete with a little digital control panel where you select your water temperature and can monitor the unit’s performance Prius-style to see whether it’s operating in pure heat pump, hybrid, or electric mode. A “vacation mode” encourages you to turn the damn thing off when you’re going to be gone for a week or more — a good idea for the owner of any tank-equipped water heater. The downside, as you probably imagine, is cost. A quick look around online shows these things starting around a grand and running upwards from there. Similar models from Rheem and others run even more, as high as $1,700 to $2k. Some states and local utility providers offer rebates, though plugging in my own zip code into GE’s rebate finder uncovered only one measly $25 rebate for me — certainly not enough to offset the $500 to $1000 difference between the hybrid’s cost and that of a standard heater. That’s optimistically a 2.5 to 5 year payoff, or about the lifespan of my last hot water heater. So if I am reading this correctly: for less than the cost of this unit, I can have someone install an on-demand system that only actually uses energy when I use it, which will be MUCH smaller, and save me even more money in the future. Where is there a market for this water heater? The Heat Pump part of the water heater can be transferred to a new tank if yours springs a leak, so that brings the cost down on the long run. 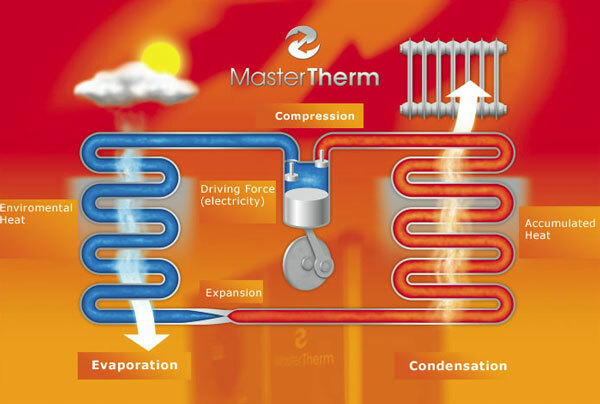 With resistance heat ie; heating element you get 1 dollar of heat for every 1 dollar you put into it. With the heat pump for every 1 dollar you put into it you get 3 dollars worth of heat. That is much cheaper than an electric on demand, which goes through elements like crazy. These are mandatory in Australia where they don’t have enough electric power generators to supply electric for standard water heaters. One drawback, if your water heater is in the basement and you use your basement, it will get really cold down there. Another is if its in a garage in the northern part of the country it will drop to below freezing in the winter and not be anywhere near as efficient, as well as maybe freezing you pipes. I see no problem using them in the south. These make a lot of sense for climates where you rarely need to heat the house. Like Texas 🙂 In Montana, it’s almost a complete waste. We only have three months during the year where we actually use AC, the rest of the time, we’re heating the house. So I’m going to heat the house, cool it off again so I have hot water, then heat it up again. Up here we use Natural Gas for most heating and Hot Water generation. Heck, we even have a few AC units that run on Natural Gas. Natural Gas is so much cheaper here than electricity, that even at 3/1 (a number I’d love to see backed up), it’s cheaper to use Natural Gas. So, at a time when natural gas prices are roughly the same as in 1976 (in adjusted dollars), with no reason expected for any increases, the North American market needs this … why? I do in home appliance repair and we received “training” (a video) on these over 2 years ago. One of the big problems you will see with these is getting someone to work on them when they break because the parts operating don’t fall under one field. You will have a high probability of needing 2 service calls when it breaks and your HVAC/appliance tech will probably end up tag teaming it with a plumber. I also don’t see this being a break even investment for most people. In the summer my family of 3 run $20-$25 a month in gas running our fast recovery tank style hot water heater and a gas stove. For me to save the amount of money claimed ($3250) in 10 years they would have to heat my water for free and send me a check for the remaining $250. It must only apply if you have high electric rates and can only have electric hot water. The reason this makes sense for SOME people is they have all electric houses. No natural gas, no propane, just electric. My brother replaced his electric water heater with one of these and his electric bill dropped the first month. It has stayed lower than it was over the last 8 months. He figured his payback to be just over a year. If you have gas, it doesn’t make sense to install one of these. Does this make the room cold? Think of it like this: takes the heat from the room, concentrates it, then puts it into water in the heater. So, the water gets hotter and the room gets colder. So, basically, it’s a very inefficient heat exchanger between your furnace and your hot water heater? Your furnace is now heating your hot water … somewhat. Hybrid water heaters are meant to be installed in spaces that aren’t heated or cooled, such as in an unfinished basement or your garage. Hybrids will still work fine in a cold basement or garage as well. They still have heating elements like a traditional water heater which act assist the heat pump but can easily work alone when the air temp is chilly. For homes with no propane or gas service the hybrid water heaters are a great alternative… more efficient than electric on-demand water heaters. I live near Phoenix and my water heater is in the garage. This would be perfect since I will have a cooler garage (by probably 5 degrees really) and probably save on electricity, as I do not get gas service to my house. Probably something to think about when my heater goes kaput. Something to consider: this water heater can be loud. GE has pictures of it installed in what looks like a hall closet or kitchen pantry. You would not want it in there — I don’t even love it in my basement. It’s not the volume of the noise so much as the pitch. An air-rushing noise would be tolerable but this is more tonal, like a siren at times.